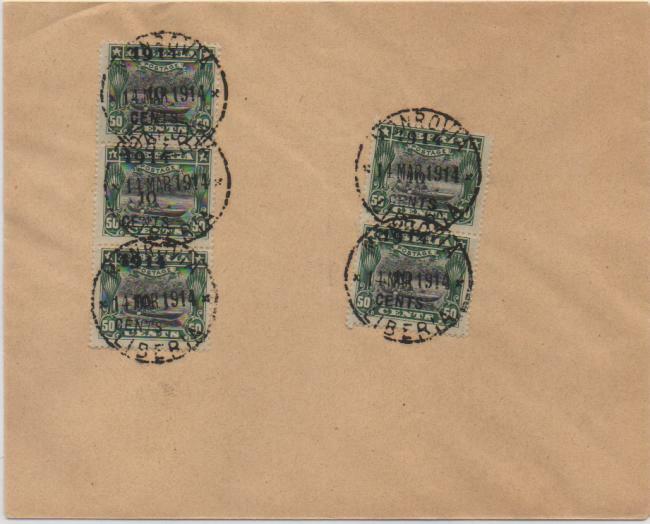 Does anyone have any used copies of 129-133,072-075 with postmarks after April 1914 ? I have one dated Jun 23 1914 on #130. Anyone have a cover with all 9 stamps on it. 129-133,072-05 ? I have one with no address. Sorry about that it should read 129-133,072-075. I assume your question refers to the stamps that were systematically postmarked and made available to collectors loose or on piece in 1914? I don't have any with a later date, and none on cover (only two on piece), but I just made an interesting observation regarding this issue. Perhaps you remember that in one of my emails I was speculating about a possible involvement of the German J. West Company in the creation or at least the cancellation of this issue? Back then I had no proof, but I believe now I found something that seems to link Germany to this issue. 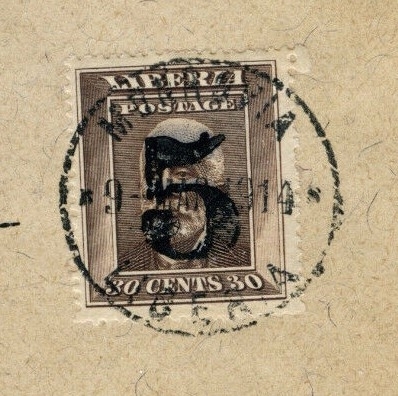 One of the paper types used for creating the used stamps on piece was cut from envelopes and has a characteristic wave pattern on the back, an overlay printed inside the envelope to obscure the content. Except for the color - light gray versus blue - the overlay patterns are identical. I believe it is reasonable to assume the envelopes produced for the Woermann Line are a German product, and the overlay strongly suggests the envelopes used in 1914 came from the same supplier. 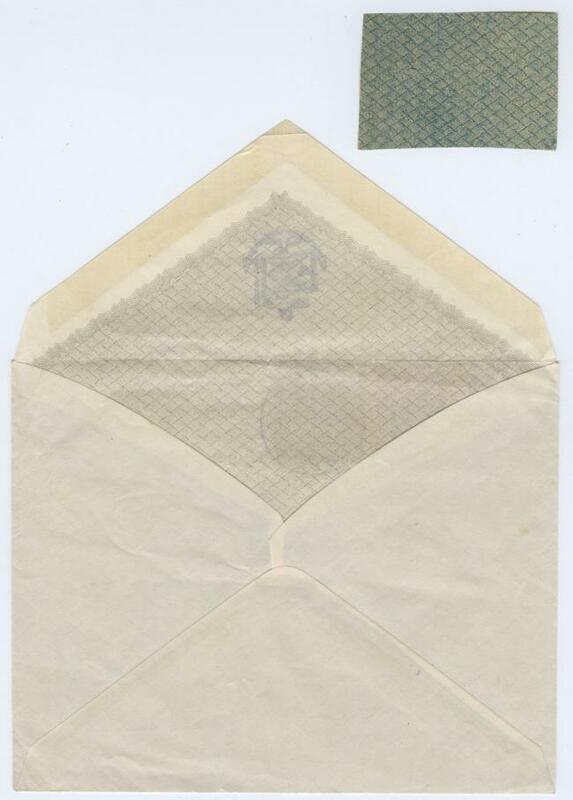 The Woermann Line may have had a office in Monrovia where you could get these envelopes. In fact maybe these were also at the Main Post Office. But why did they put them on these envelopes and then hand stamp them with SON cancels ? Who was in charge ? Was it Bela Szekula or maybe one of his brothers ? Does anyone have more info on this ? Please join it. 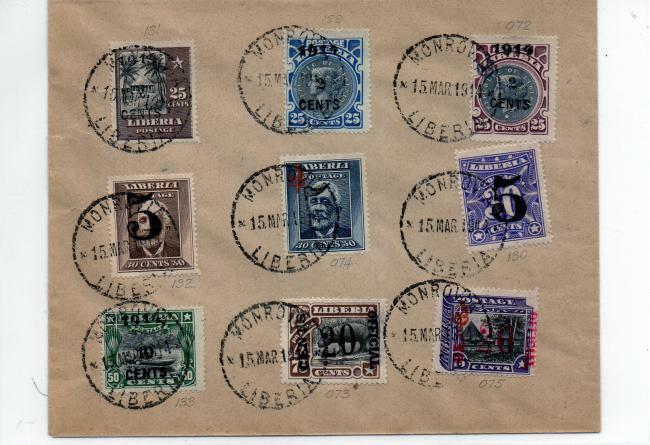 Here are 2 covers from my Liberian collection with the 1914 stamps. 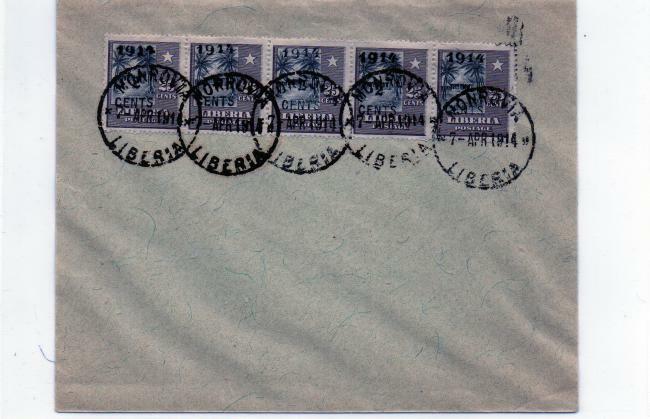 One shows ALL the stamps on one cover. The other shows a strip of 5 of #131. I checked but covers under a strong light, they do not have that overlay pattern of the Woermann enevlopes. 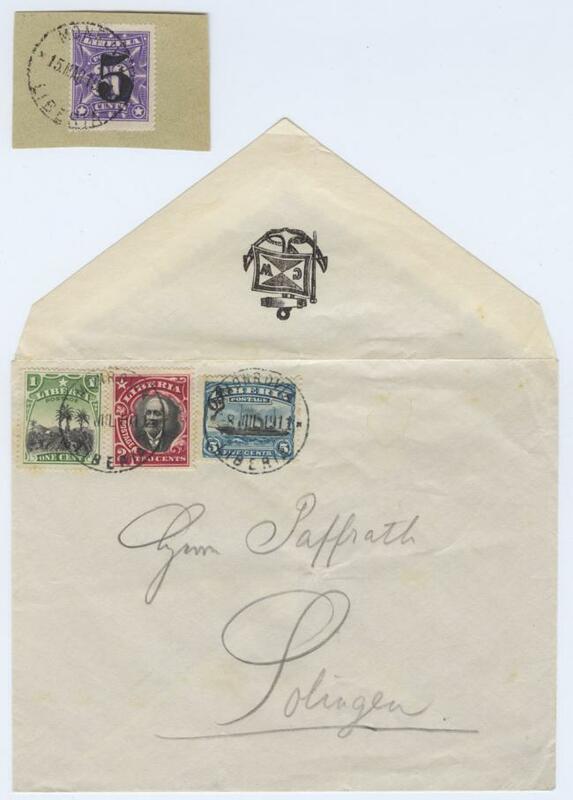 My point was that the producer of the Woermann envelope and those used for the 1914 issue, at least some of them, was the same, and most likely German. This is important because the 1914 envelopes are not known from other correspondence sent from Liberia, according to all accounts dealing with this issue. Obviously they were not available to consumers in Monrovia. In fact, the paper being so unusual was one of the reasons why people suggested in the first place used pieces might have been produced outside of Liberia. If, on the other hand, we assume that this issue was canceled in Liberia, and the paper is of German origin, we have the problem that someone must have exported a batch of special envelopes from Germany, specifically for that purpose, or at least not meant for resale to end users. By 1914, J. W. West must have already had a contract with the Liberian government to act as stamp agent, and it was one of the leading trading companies in Liberia, and German - they fit the profile. OK...guys we have 8 people signed on...but only 3 people are doing leaving messages. Does anyone have any info on the 129-133, 072-075 ? Does anyone have any covers of 129-133, 072-075 to post on this site ? Also any errors or blocks of this issue ? Please take some time and post anything on this issue. 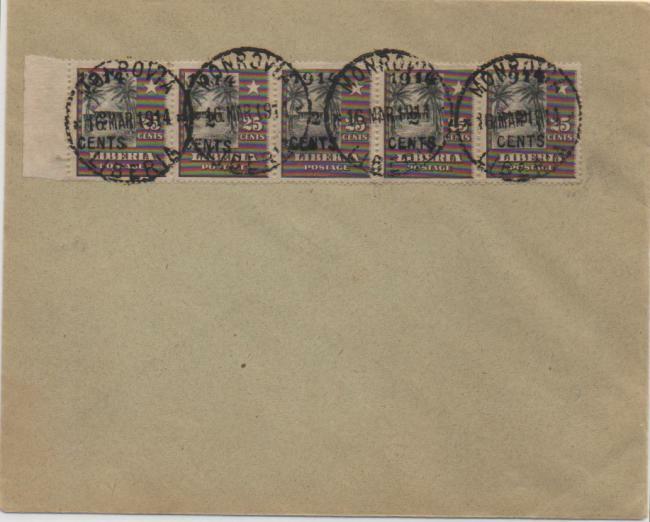 Philatelic cover to Lübeck, franked with SG 279 to 283 + O285 to O287. 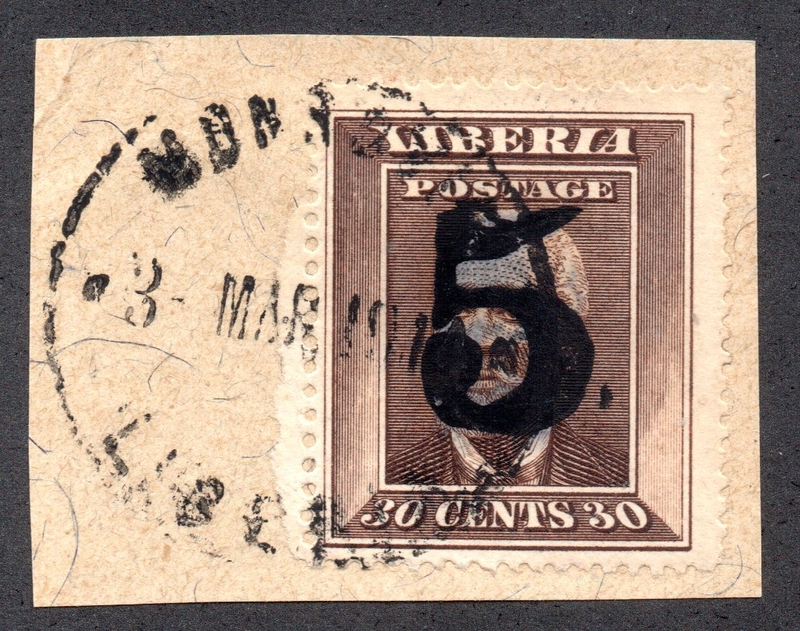 Cancelled Monrovia 6 APR 1914. No arrival CDS. The envelope is a pre-printed J. West commercial envelope, which seems to indicate that the "European agent in Monrovia" who according to Cockrill (booklet no. 9, p. 22) "bought up more or less the whole supply" was a German employee of West & Co. and not a Swiss, as suggested by Cockrill. 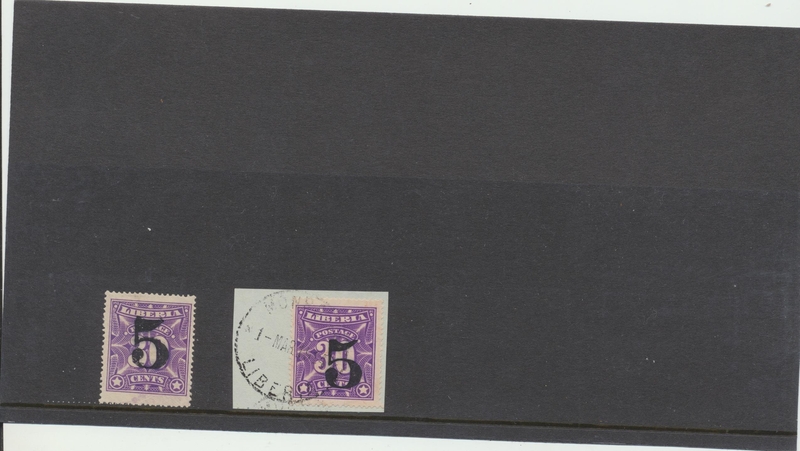 Here are 3 more covers with the 1914 issues.The one with the strip of 5 has the overlay pattern in it. The other 2 covers do not have the overlay inside. 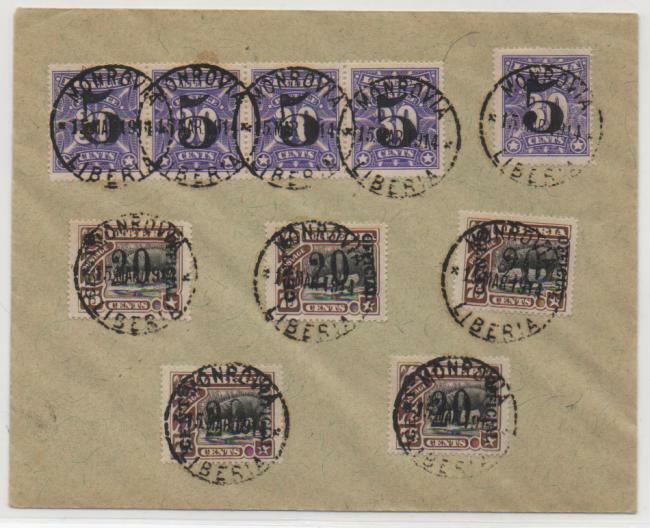 These show how stamps were placed on covers. I guess the next is to cut them off before sale. Does anyone have any more covers like these ? If so please post them for us to see. Still collecting this issue after 45 years. Does anyone have any NEW ideas about this issue. 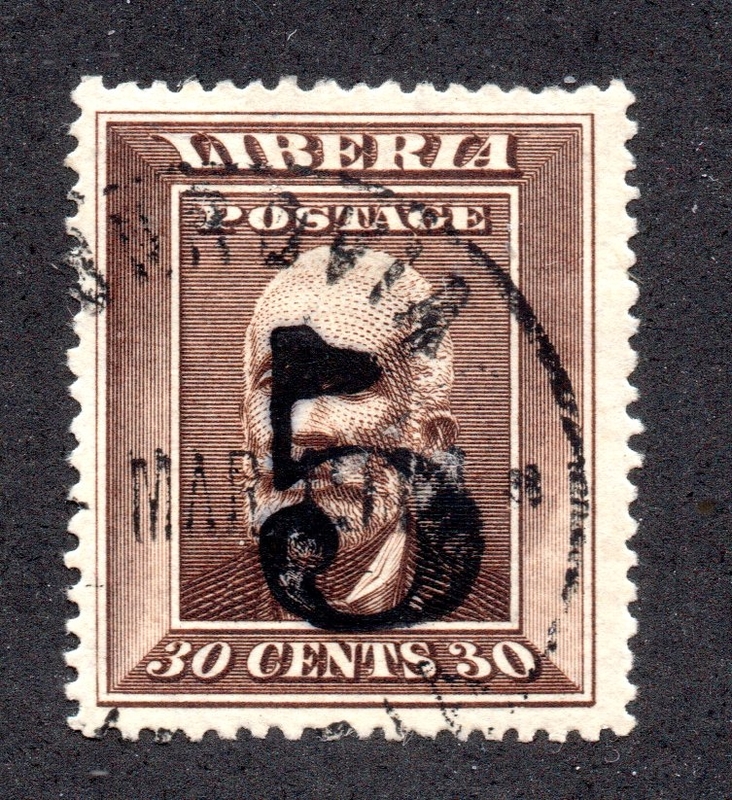 Was the overprint and cancels done in Liberia or someplace else ? Also do you think the Szekula (Sekula) brothers had anything to do with this ? 15 March 1914 was a Sunday ! The July/September issue of the LPS has a wealth of information on this issue. This forum makes a great addendum to the articles therein. That July/September issue was from 2012. Great story. Loaded with info on this issue. Happy New Year. Double overprint of 132, most visible in the thin vertical stem of the “5”. Close inspection of the single large numeral “5” on the five cent surcharges of the 1914 issue reveals two types of font. One in which the flag of the five flares outward, and a second in which the flag is more blunt and concludes with a slight upward curl. 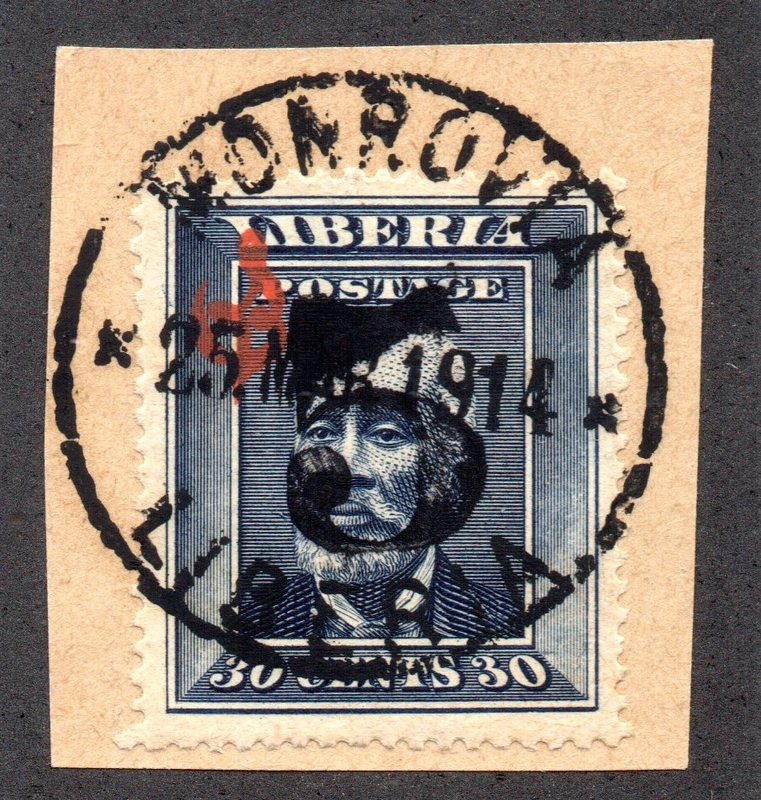 The double overprint herein includes both types, carefully applied one upon the other. In the section of Henry’s article dealing with varieties of this issue, he notes only one known variety of 132, a double overprint. He states that he has not seen one but it is listed by Saleski, which is sometimes suspect. This stamp confirms the existence of 132 with a double surcharge, albeit with two different fonts of the “5”. I believe it might be unique. Does anyone out there have another like it? Interesting to note that this stamp is on a piece of typical European envelope with the distinct grillework pattern on the inside. Did you get that from a dealer in AZ named Glen ? Yes I did. His name is Glen Campman. I have bought several items from him through the years. But I have seen no Arizona connection. His mail comes from Albuquerque, NM, and his contact info is in Las Vegas. Why do you ask? Because i was bidding on that...You outbid me at the last...Oh well sometimes it happens. seredag, you mention two fonts for the "5"
Also, as I commented earlier it seems very odd that some of the cancels are dated for a Sunday - why would the Post Office be cancelling on such a day? Here are 2 photos that come from my collection of over 540 copies of #129-133, O72-O75. #132 with a big fat 5. #O74 with looks like a double print of the 5. Here is a photo of #132 with the tip of 5 missing. Interesting discussion. In my experience it seems that the best way to determine if a surcharge is double or not is to focus on the vertical stem of the 5. It is always very thin. A sideways shift of the double surcharge becomes most obvious at this location. Similarly, the top of the curve of the "ball" of the 5 is also very thin. A vertical misplacement of a double strike would be most obvious here. For those reasons, I would think your top scan is doubled (actually seems to be doubled all over), but not your official, although I'm not sure what to make of the blob on top. I think #O74 is a double print. If you look at the TOP bar of the 5 you see one bar is even and the other print is at a angle going up. Check out the tip of the bottom of the 5 that comes to a small upward circle and look close i see two diff size circles on top of each other. One is large the other is smaller. Or i could be wrong. But there is something going on with that 5 overprint.